Bloom County was a popular comic strip by Berke Breathed which ran from December 8, 1980 until August 6, 1989. It examined events in politics and culture through the lens of a fanciful small town in Middle America, where children have adult personalities and vocabularies and animals can talk. It grew out of a strip called The Academia Waltz, which Breathed drew for the student newspaper while a student at the University of Texas. 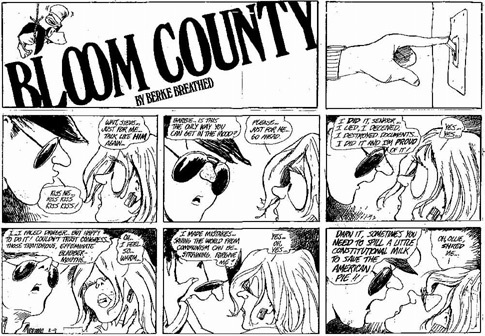 The fictional setting of Bloom County served as a recurring backdrop for the comic and its sequels, although the nature of the setting was frequently altered. In the comics, the county is presented as a stereotypical American midwestern small town (although the state in which the county exists is never explicitly mentioned). The small town setting was frequently contrasted with the increasing globalization taking place in the rest of the world; though Bloom County contained the likes of farmers and wilderness creatures by default, it was frequented by Hare Krishnas, feminists, and rock stars. The county was home to the Bloom Boarding House, Steve Dallas' law offices, the Bloom Beacon and Bloom Picayune newspapers, at least one pond, and Milo's Meadow. In the comic's later years, the county contained what appeared to be a big-city ghetto ("across the tracks", as it was known). The geographical profile of the county was fluid as the artistic style of the strip evolved. During most of Bloom County's run, the rural meadow setting was presented realistically, while in its later years it became increasingly more abstract. Bloom County's role in Outland was a bit questionable, as the Outland setting of the strip was originally set apart from the county by way of a magical doorway. By Outland's end, however, the Outland appeared to be a part of Bloom County itself. Opus currently takes place in Bloom County.